We are pleased to offer one of the world's largest collections of original Lehnert and Landrock héliogravures (photogravures) from around 1900–1930s of iconic scenes of natives and locales in Northern Africa: Tripoli, Algeria, Tunisia, and Morocco for the most part. The founder of our business, Fred T. Darvill, Sr., was so enchanted with these prints when he visited Egypt in the early part of the 1900s, that he bought several thousand and had them shipped back to America to be offered for sale in the rare print shop. It is from this collection that we still offer today the stunning original images of Lehnert and Landrock. From the pages of the National Geographic magazine and picture postcards on sale in European kiosks nearly one hundred years ago, to the black and white prints that sell year in and year out at the Sherif Street bookstore that still bears their name, the photographs of Lehnert & Landrock sustain a vanishing romantic image of the Arab world. These authentic heliogravures (sometimes referred to as photo lithographs or photo engravings) measure approx. 9.5 by 12 inches (23 x 30 cm) and are generally sepia-toned, but many have been coloured by a seemingly hand-tinted photo process. Several larger desert panorama scenes are also available, measuring approx. 12 x 23 inches (30 x 60 cm.). The photographs were taken by Lehnert and Landrock in Tunisia, Algeria, Morocco, and Spain (the Alhambra). Unfortunately, we do not have specific identifiers for each photo except for the Alhambra photos. Though many of the original glass plate negatives were rediscovered in 1982, it is believed the glass printing plates for the amazing images in our collection were destroyed during the American & British bombardment of Germany in World War II. Lehnert & Landrock were a German-Bohemian photography duo. 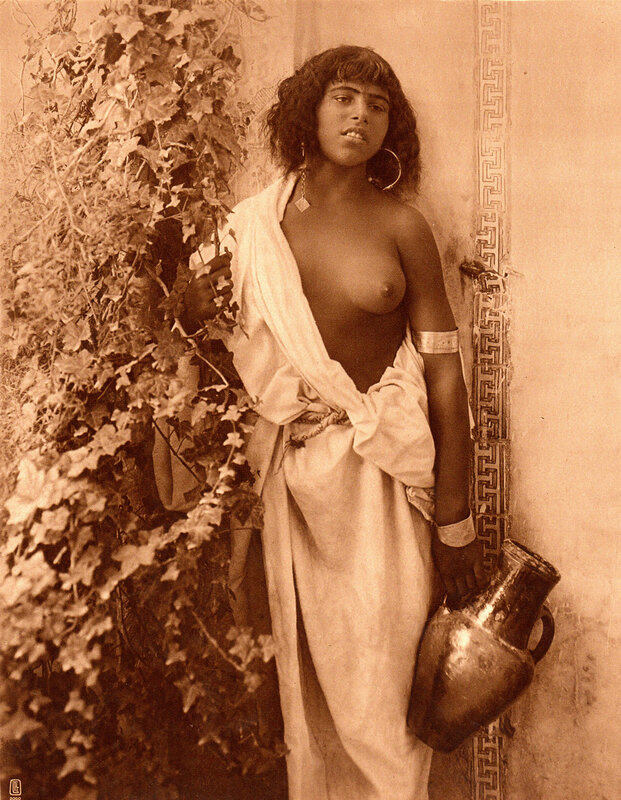 Their hand-tinted photographs featured Egyptian and Tunisian monuments and, more controversially, eroticized images of Arab women posed within harem scenes. Lehnert & Landrock’s photographs attempted to embody a romanticized vision of the Arab world held by Europe, intended to titillate rather than serve as a true document of everyday life in the region. The artists were Rudolf Franz Lehnert, born on July 13, 1878 in Velká Úpa, Bohemia, and Ernst Heinrich Landrock, born on August 4, 1878 in Reinsdorf, Germany. Upon returning from a trip to North Africa, Lehnert met Landrock in Switzerland and the two decided to go into business together. Lehnert acted as the photographer and Landrock organized the expeditions, photolab, and marketing of postcards, posters, and prints. They lived both in Tunis and Cairo but periodically made trips back to Europe throughout their lives. Today, their works can be found in the collections of the Penn Museum Archives in Philadelphia, the Musée de l’Elysée in Lausanne, and the San Francisco State University Museum, among others. 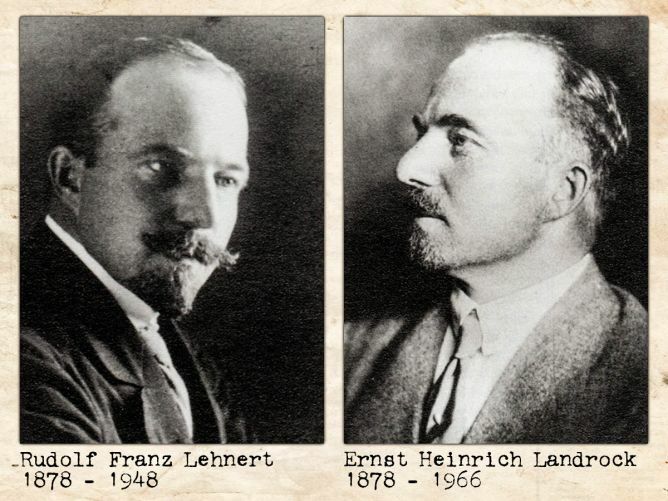 Lehnert died on January 16, 1948 in Reydef, Tunisia, and Landrock died on April 30, 1966 in Kreuzlingen, Switzerland. CARDINAL, Philippe. Lehnert & Landrock: L'Orient d'un photographe. Lausanne: Favre, 1987. Has one of the best texts. FAVROD, Charles & André ROUVINEZ. Lehnert & Landrock: Orient 1904-1930. Paris: Marval, 1999. Has the best selection of illustrations. GABOUS, Abdelkrim. la Tunisie des photographes 1975-1910. Paris: Éditions du Cygne, 1994. A general study of most of the workshops working in Tunisia in that period. MEGNIN, Michel. Tunis 1900-1910 Lehnert and Landrock photographes. Paris: Apollonia Éditions, 2005. Many of the illustrations came from gravures in our collection! PEREZ, Nissan N. Focus East: Early Photography in the Near East 1839-1885. New York: Abrams, 1988. Does not have any material on L & L but is the definitive text on early Near East work, with necessary background information, useful in making judgments for purchases.